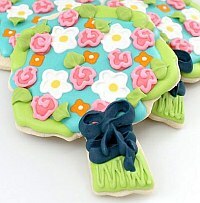 Home » Artist Profiles » Cookies Anyone? Yes, it’s been a terribly long time since I’ve posted anything here. I admit the spammers have gotten me down a bit on blogging – some days it seems like they are the only ones who come around and visit anymore. So, enough with the woe-is-me and on to the business at hand. It’s yummy business. Works of art on cookies. This week’s submissions to Crafty Tips included a very talented cookie artist. Not sure if there’s such a thing as a “cookie artist” but this baker would certainly qualify if there is. Just look at some of the beautiful cookies she has made. Not only does this talented baker show off her creations, she offers tutorials on creating your own. I don’t know about you but these look too pretty to eat. Please check out the great sites we have listed on Crafty Tips in the Edible Crafts category. And, be sure to visit Sugar Belle’s The Sweet Adventures of Sugarbelle to learn all about making your own edible works of art. This entry was posted in Artist Profiles, Crafty Tips, Great Websites. Bookmark the permalink. 2 Responses to Cookies Anyone? 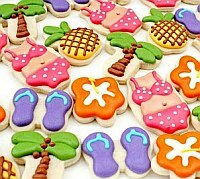 Those are some beautiful cookies! I think anyone who can make cookies like that deserves to be called a cookie artist at least. I couldn’t agree more Geoff. Maybe I’ll start a new buzzword. Thanks for stopping by.